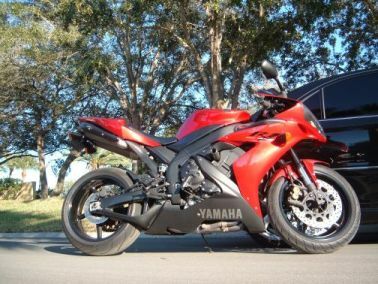 Description It is a 2004 Shift Red R1 with the stock exhaust baffles swapped for V & H. This means that the exhaust looks stock but is VERY LOUD. And I mean VERY VERY LOUD. If this bike rolls up next to you you will definitely know it. It also has the black "double bubble" windshield. Many parts on the bike (clutch/brake handles, foot guard, foot pegs) that would normally be silver are powdercoated black. It has a rear seat eliminator that matches the color of the bike. There is a black tank protector (the one that goes right in front of your nuts on the gas tank) - don't know the brand. Stock turn signals There are no rear footpegs. Rear sprocket is aftermarket (don't know anymore about it) New Michelin 2CT tire on the rear.